A vacant parking lot in the North Loop could soon be redeveloped into a ten-story condo building. Located at 100 N 3rd Avenue and just steps from some of the North Loop’s best shopping, TMBR would stand 119’ tall and feature residential space, commercial space and underground parking. 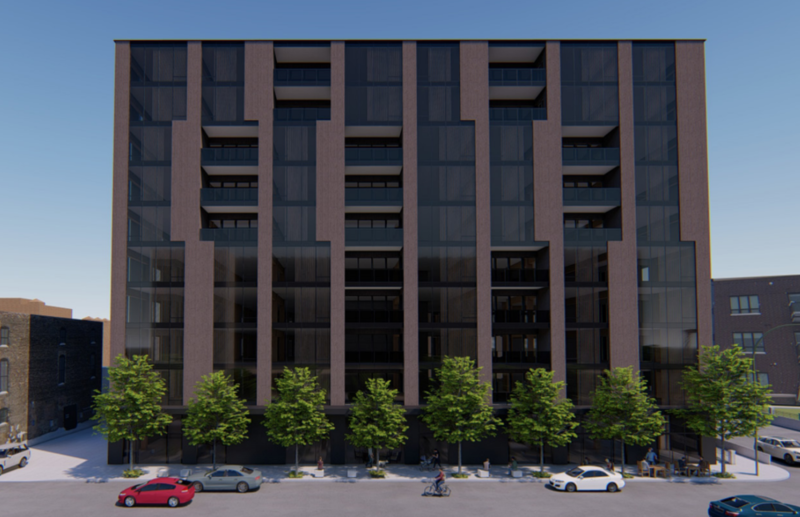 Plans show the ground floor of the building being split between private residential amenity space and public retail space with the upper floors being devoted to 84 condos. Residents within TMBR would have access to a large lobby located off of N 3rd Avenue along with a fitness center, mail room and bike room. Units within the building would range in size and include one, two and three-bedroom units. A number of units within the building would also have access to large, and we mean large, private recessed balconies. 114 parking spaces would be located on three underground levels within the building along with a small recessed surface lot. Access would be provided by an existing curb cut along N 3rd Avenue. Dwyer Oglesbay is the architect behind the design of TMBR which will be clad in glass and terra cotta. Downtown Resource Group (DRG) has been brought on to sell the condominium units within the building. Six different retail spaces covering 5,000 square feet would line N 3rd Avenue. The goal is for the retail space to become home to shops that will help strengthen the North Loop’s already vibrant shopping scene and also a newly vibrant block. Just last year Paster Properties completed the restoration of a historic commercial building with ground floor retail space next door to the site that TMBR would be constructed on. The building is now home to Chicago-based Fairgrounds Craft Coffee and Tea and next month will also become home to a Lululemon location. An additional, unannounced, retailer has also signed a lease for space within the building. TMBR will be presented for feedback to the Historical Preservation Committee today, March 19th, at 4:30pm.